Super Typhoon Haiyan: Largest weather system on record: 60 hours, Cat. 5 status for 2 days, sustained winds 190 mph, gusts 230 mph. -- HEWSWEB: Latest Storm Maps. Call for FEMA Review/Funding for Coastal Communities - 2009 Hurricane Preparedness Initiative: Humanitarian Resource Institute, 11 May 2009. In U.S. coastal cities impacted by major hurricanes, one of the most significant variables associated with property damage and destruction has been residential and commercial construction that is not conforming with standards set forth by the FEMA National Flood Insurance Protection program . See "Reducing Flood Losses through the International Code Series" (FEMA Library). Hurricane preparedness initiatives in Milford, Connecticut has focused attention on direct waterfront construction in coastal high hazard areas under the construction standard required for a non-high hazard area. The inability for citizens to obtain assistance by local municipal programs, has been further complicated by the lack of assistance by the State Building Department (Public Safety) and Department of Environmental Protection. Discussions on the federal emergency management level have revealed similar challenges that impact all coastal communities in the United States, prompting the development of this national education initiative to assist with mitigation and risk management discussions. Any structure that is direct waterfront exists in a coastal high hazard area and provides a barrier between the ocean and the coastal community. The risk of damage associated with hurricanes is proportional to the the size of storm (surge, wind speed, etc., etc.). 65-82 kt 74-95 mph >980 mb >28.94 in. 83-95 kt 96-110 mph 965-979 mb 28.50-28.91 in. 96-113 kt 111-130 mph 945-964 mb 27.91-28.47 in. 114-135 kt 131-155 mph 920-944 mb 27.17-27.88 in. >135 kt >155 mph <919 mb <27.16 in. Storm Surge and Waves: Surge - A steady rise in sea level, Waves are on top of surge, Elevation is key to home survival.... Protecting Homes from Waves and Flooding - Elevation is the Key to Survival, Properly Embedded Piles, Continuous Load Path. -- Hurricane Damage Mitigation for Homeowners, FEMA, ppt. 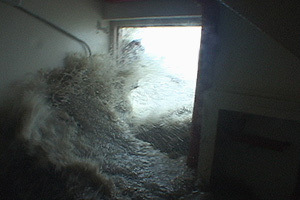 Storm surge is simply water that is pushed toward the shore by the force of the winds swirling around the storm. This advancing surge combines with the normal tides to create the hurricane storm tide, which can increase the mean water level 15 feet or more. In addition, wind driven waves are superimposed on the storm tide. -- Storm Surge: National Hurricane Center, NOAA. Hurricane Katrina 28 Foot Storm Surge: YouTube. Home Builder’s Guide to Coastal Construction Technical Fact Sheet Series (FEMA 499): Download all Fact Sheets. FEMA's three-volume Coastal Construction Manual covers everything from the history of hurricane destruction to load calcs and construction details. Even its tagline — Principles and Practices of Planning, Siting, Designing, Constructing, and Maintaining Residential Buildings in Coastal Areas — is massive. Yet this work lives up to its billing, providing a veritable bible for the coastal builder. Available free in print or on CD from the FEMA Publications Distribution Facility, 800/480-2520. tsunamis ranging from the 1900 hurricane that struck Galveston, Texas, to Hurricane Georges, which struck Puerto Rico and the U.S. Gulf coast in September 1998. Chapter 3 – Coastal Environment. This chapter provides an introduction to coastal processes, coastal geomorphology, and coastal hazards. Regional variations for the Great Lakes, north Atlantic, middle Atlantic, south Atlantic, Gulf of Mexico, Pacific, Alaska, Hawaii, and U.S. territories are discussed. Chapter 4 – Fundamentals. This chapter provides an overview of acceptable levels of risk; tradeoffs in decisions concerning siting, design, construction, and maintenance; and cost and insurance implications that need to be considered in coastal construction. Chapter 5 – Identifying and Evaluating Site Alternatives. Detailed discussions of the coastal construction process begin in this chapter, which presents information on which to base the selection of a site for a coastal residential building. Chapter 6 – Investigating Regulatory Requirements. This chapter presents an overview of building codes and Federal, state, and local regulations, including the NFIP, Coastal Barrier Resources Act, and Coastal Zone Management programs, which may affect construction on a coastal building site. Chapter 7 – Identifying Hazards. This chapter provides information about hazards that will influence the design and construction of a coastal building, including coastal storms, erosion, tsunamis, and earthquakes, and their effects. Chapter 8 – Siting. This chapter describes the factors that should be considered in the selection of building sites, including small parcels within already developed areas, large parcels of undeveloped land, and redevelopment sites. Also provided is guidance that will assist designers and contractors in determining how a building should be placed on a site. Chapter 9 – Financial and Insurance Implications. This chapter includes explanations of short-term and lifecycle costs associated with alternative decisions regarding siting, design, and construction. Included is a discussion of different types of hazard insurance and the effects that decisions regarding where and how to build have on insurance purchase requirements and rates, including premium discounts. Chapter 10 – Introduction to Volume II. Chapter 11 – Determining Site-Specific Loads. This chapter provides information on calculating site-specific loads, including loads from high winds, flooding, seismic events, and tsunamis, as well as combinations of more than one load. Chapter 12 – Designing the Building. This chapter provides designers and builders with information needed to design each part of a building to withstand the expected loads. Topics covered include structural failure modes, load paths, building systems, application of loads, structural connections, the building envelope, utilities, and appurtenant structures. Chapter 13 – Constructing the Building. This chapter provides information needed to properly construct a building in a coastal area. Information is provided on ways to avoid common construction mistakes that may lessen the ability of a building to withstand a natural disaster. Chapter 14 – Maintaining the Building. This chapter explains special maintenance concerns for new and existing buildings in coastal areas. Methods to reduce damage from corrosion, rot, fatigue, and weathering are provided along with descriptions of building elements that require frequent maintenance. Volume III contains the appendixes referred to in Volumes I and II.